My thirteen hour Singapore Airlines flight from Heathrow to Changi was on time as usual, allowing me exactly one hour before my Silk Air connecting flight to Siem Reap, left at 8.45am. In the queue for the flight to Cambodia, I bumped into an old pal, Peter Leth, returning to Phnom Penh from the US and arranged to catch-up later in my trip, as well as meeting Nancy Beavan, a New Zealand doctor involved in the carbon-dating of burial jars found in the Cardomom Mountains. The incoming flight was only a quarter full and after the usual airport and visa formalities were completed (only eight police required to process my visa on this occasion), I linked up with Rieng outside the terminal, a beaming smile from ear to ear as usual, who'd come to collect me in his father-in-law's shiny white Toyota Camry. Rieng confirmed that he'd taken leave from his usual jobs as both a policeman and Angkor guide, to put himself at my disposal during my time in Siem Reap as my guide, driver and friend. We drove to the HanumanAlaya guesthouse, located in a quiet neighborhood next to the river and the Angkor Conservation compound and were welcomed by the efficient receptionist Sina, before a quick-fire visit to catch-up with Dave and Colleen at their new Peace of Angkor premises and an invite from two of their guests to visit a school they'd been volunteers at for the past week. By sheer coincidence, it was sponsored by Schools for Children of Cambodia (SCC), a UK charity we'd supported at our Magic of Cambodia day a few months before and which I'd intended to visit whilst in Siem Reap to see their worthy efforts at first-hand. So my first afternoon was now arranged. Rieng dropped me near the old market and I popped into one of the numerous internet cafes that have sprung up, to let my family know that I'd arrived safely. Next door I had a relaxing lunch on the balcony of the Red Piano restaurant before Rieng returned at 2pm and we headed out along the road towards the Tonle Sap lake. Turning left across one of the small bridges over the Siem Reap river, we negotiated a narrow lane until we reached the gates of the Amelio school in the village of Spean Chreav. Alison and Beth, from New York and Baltimore respectively, were helping out at the school whilst on vacation and were busy taping the results of their photography sessions, working with a group of 11-15 year olds, to the outside wall of one of the classrooms. Standing closeby were some of the children, who were clearly pleased with their handiwork, having taken pictures of family, friends and their surroundings, and not shy in showing me their favourite photos. An hour later, Ung Savy, the director of the school and the SCC representative, arrived with a group of travellers from the adventure tour company Intrepid, in time to watch the youngsters put on a demonstration of five different traditional dances, with each of the dancers in a colourful costume. 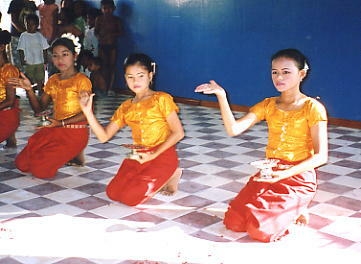 Five of the girls began with the flower dance, followed by a mix of boys and girls in the coconut, fisherman, butterfly and crab dances. 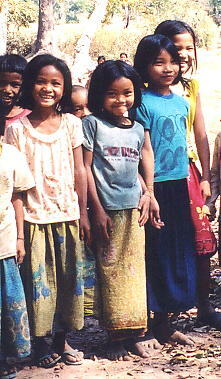 A very enjoyable hour was rounded off with a ramvong dance which everyone, children and audience alike, joined in. At 4.30pm we said our goodbyes to everyone at the school and headed back into town to visit Rieng's wife, Sovann and family, to make a fuss of his two year old son Nara and to discuss our temple-hunting plans for the following day. My evening meal at the Continental Cafe near the old market was disappointing before a tikalok fruit-shake on the way back to my guesthouse and an early night in preparation for the next morning's exploration. The HanumanAlaya is a quiet and relaxed haven, tastefully decorated in dark local timbers with cool balconies and well appointed rooms. Its part of the Hanuman Tourism operation run by my pals, Nick and Kulikar Ray. Breakfast was served at 7am by the lovely Borain and Rieng arrived at 7.45 accompanied by his father-in-law Heng driving a 4WD. All my previous temple expeditions with Rieng had been on his moto, so this was the height of luxury. The 4WD is owned by a mutual friend of ours, Merrily Hansen, so it was all above board, and I settled into the front seat to enjoy the drive and the cool air con. 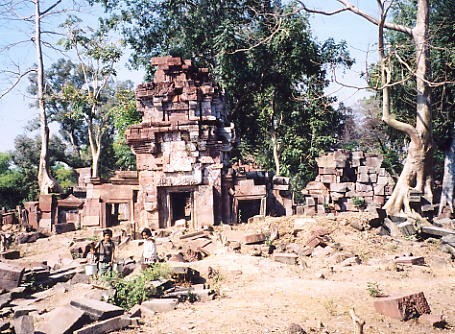 Our target, as we headed out along Route 6 towards the airport and beyond, was a handful of temples in the Angkor Chum district, some 50 kilometres or so northwest of Siem Reap. It wasn't completely new territory for Rieng and Heng, but it was for me. It took us an hour to reach Sasarsdam, 30 kms from Siem Reap, where we turned right and off the busy main highway and another thirty minutes to Angkor Chum village, where we forked left after Donsva school. 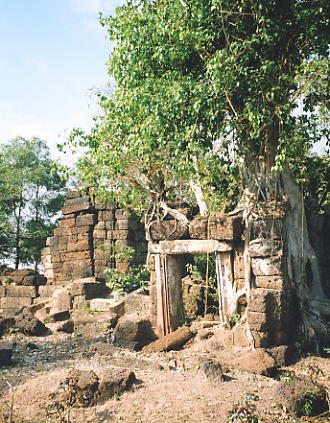 A nondescript track towards the village of Koul led first to a small laterite temple with a surrounding wall, which Rieng named Prasat Takom. 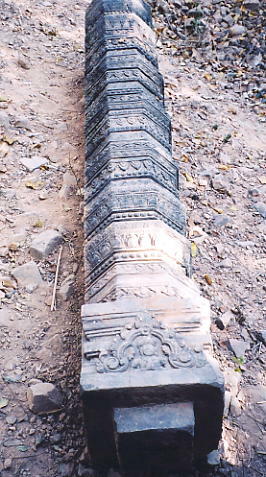 Broken pieces of sandstone lintel littered the floor around a central tower split in two by a large tree sprouting skywards, an undamaged laterite library and a ruined gopura [entrance pavilion]. 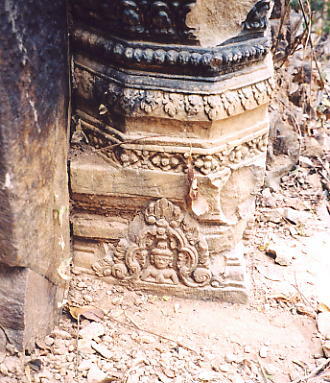 Rieng, using his knowledge as an Angkor guide, thought the temple likely to be from the 11th century, though a defaced floral lintel still in situ was substantially earlier in origin, probably 9th century. 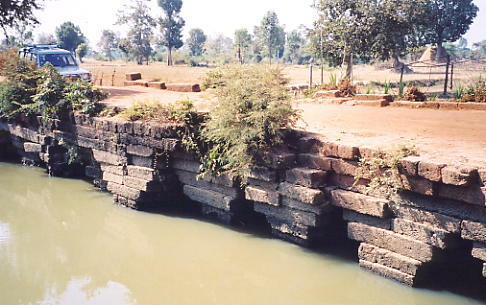 A small pool with laterite steps, just outside the enclosure wall completed the temple lay-out. 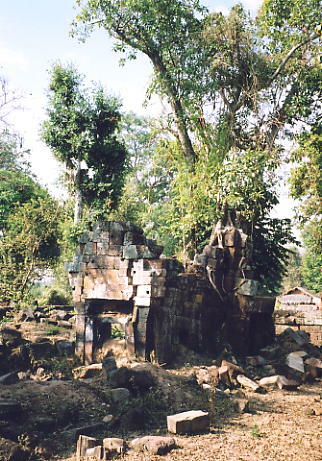 As we passed the village of Koul nearby, visible from the road was a second, considerably larger temple called, not unsuprisingly, Prasat Koul. 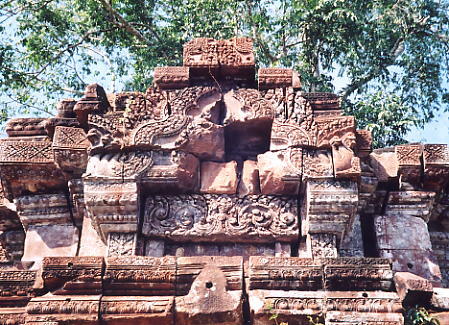 Occupying a wide area surrounded by a sandstone wall, an inner (dry) moat, three large entrance gates, two libraries, a massive northern gallery wall and a completely ruined central sanctuary with two entry gopuras, Prasat Koul still has intricate carvings on its walls and lintels, which suggests a 12th century construction. In its hey-day, the temple would have been of a significant size, but today, it's mostly in pieces. 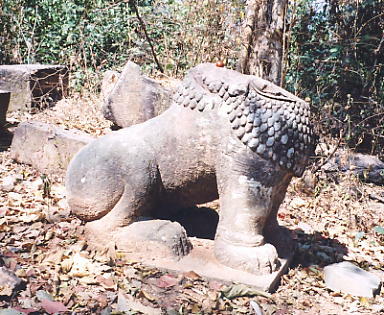 It took us a good forty minutes to walk the ruins and to chat to a couple of locals who told us that an intact lion statue had been stolen from the south gate last year and that the temple was also known locally as Prasat Takom Thom. 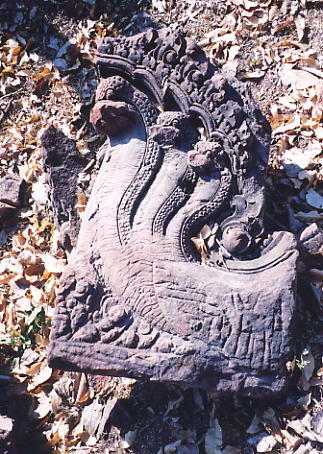 Returning to the main road, we carried on til we came to a sizeable and sturdily-built Angkorean laterite bridge, Spean Thma, spanning a wide river with a broken naga body along the roadside. We counted twelve arches though with the water level still quite high for the time of year, it restricted any closer inspection. Retracing our steps and stopping for directions, Rieng recognised one of the moto-drivers at the Angkor Chum crossroads as the local police deputy and asked whether any other 'prasats' were nearby. With much arm waving, pointing and friendly arguments over names, we were soon on our way, making a left turn along a bumpy and sandy track, heading for Prasat Trav. 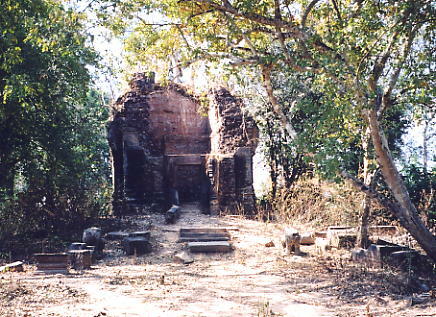 Half an hour later we arrived at Trav village and standing on a small rise amongst trees behind the school was the temple, surrounded by the indentation of a dry moat. 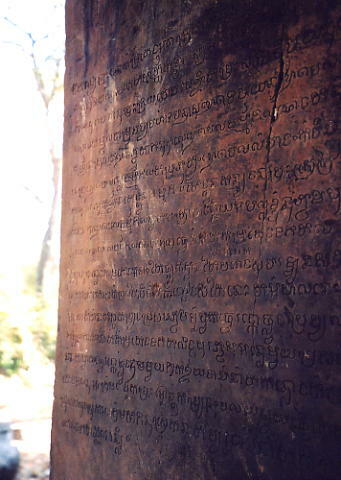 A large single brick tower, destroyed above the main doorway and lacking a roof, it did still house two intricately carved colonettes, an inscription in Khmer on the doorframe, three false doors, two pedestals and two headless lions guarding the entrance. 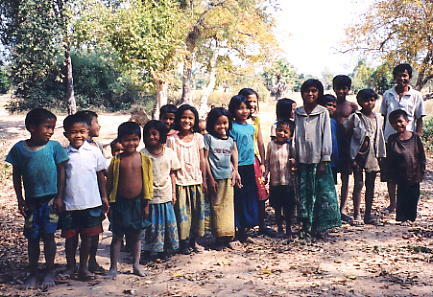 Not long after our arrival, a group of twenty or so children appeared to see what all the fuss was about, as we decided to take a rest and have our lunch - Rieng had packed rice and chicken, as well as an icebox with drinks - in the shade of the ancient temple. Fed and watered, we then headed for a temple that the police deputy had identified, though it took an hour by 4WD to reach it via a series of bumpy tracks. We arrived at Wat Kralanh just after 2pm to find a new wat under construction on top of the laterite base of a much older temple. 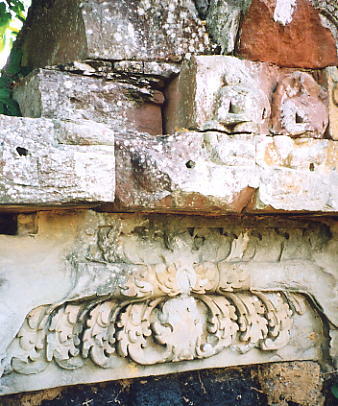 At the front of the wat, a broken lion and naga antefix's [decorative corner pieces] provided some evidence, whilst behind the new building, the remains of one wall of a small brick tower stood in the shade. Not one of my greatest discoveries but if you don't look, you might just miss a real gem! We headed back towards Angkor Chum and enroute encountered the waves and giggles of a female road-building crew, a fairly familiar sight across Cambodia as young girls, their faces protected from the sun by hats and scarves, spend their day filling, carrying and depositing baskets of tiny stones on the new road surface. Heng, clearly an expert driver though limited in his spoken English, suggested that we call into see one of his daughters, Dari, a teacher at the village school of Kdei Run, which was on our way back to the main highway. Unfortunately Dari was visiting a friend nearby after only two of her pupils arrived for lessons that day and her class had been cancelled. Whilst we waited for her to return, the school's director, Nhien Bun Tay proudly informed us that the school caters for nearly 700 pupils at various times, in eight classrooms, half of which were open-sided wooden rooms, with a staff of ten part-time female teachers. Dari, who lives in Siem Reap with her parents and extended family, later explained that the trip to the school takes her two hours each way by moto, and unable to get a teaching job in town, she had to take up this post a few months earlier. 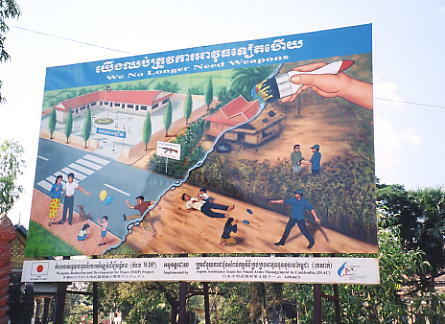 A similar story was told by Kunthear, who couldn't get a job in her hometown of Kompong Kdei and moved to Sasardam for this post. 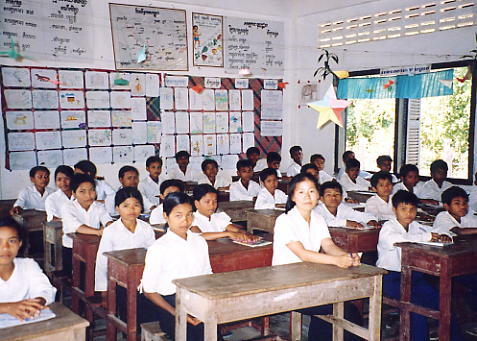 Twenty years old and one of three teachers in her family, she introduced me to her class for an impromptu lesson of repeating words as I said them and then the bravest of the pupils asked the usual questions, such as, what's your name, etc. 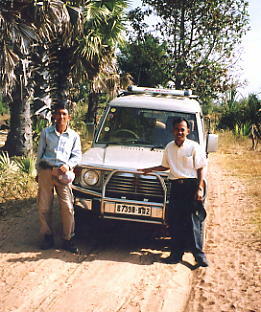 The school closed early so the teachers could go home in the late afternoon light and whilst Dari donned her crash-helmet for the long journey home, we gave Kunthear a lift to Sasardam, and arrived back in Siem Reap just before 6pm. Overall, a pleasant day trip with Rieng and Heng to a new location. The 4WD doesn't protect you from the bumpy road, despite Heng's expertise, but it does keep the sun off and the dust out and so early in my trip, I was grateful for that. On previous occasions, a day out looking for temples with Rieng [on his moto] would usually result in being covered in a layer of red dust and my face already turning bright pink from the sun. A Pre-Angkor Conference taking place at the Center for Khmer Studies had attracted lots of key scholars and amongst them, Dawn Rooney, author of the widely-read and photocopied Angkor, and a guest speaker at the Magic of Cambodia day, was in town and I paid her a visit at the Royal Crown hotel for a chat before eating alone at the Red Piano restaurant, quickly becoming my favourite eatery, checked my e-mail next door and finished the evening with a tikalok at a stall along the road to the temples, before retiring to bed at 9.30pm.